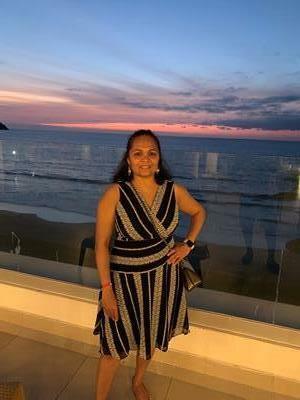 Dipali Rabadiya was born and raised in Gujarat, India and now lives at Greensburg, Pennsylvania (suburb of Pittsburg) with her husband and two sons. Her interest in art was developed when she was very young. she has always enjoyed painting and drawing ever since she was a child and never stopped thinking about it. She took various paintings and Drawing classes at very young age. She received her degree in Masters of Business Administration and graduated in 2002 from India. She moved to America in December of 2002, and worked for few years in logistics companies in USA. Her interest of being an artist has never stop so, she began to pursue her Degree in BFA at Seton Hill University in Greensburg, PA. She took workshop with Qiang Huang and various other artists. she has won Genesis award at Newport News, VA.
She is self representing Daily painter. She paints from observation and her painting style is Alla prima. she enjoys small still life and landscape paintings in her studio at home. She believes that painting small and often improves the artistic skill and encourages an individual to be more creative their field. She updates her work on her blog, Instagram and eBay auctions.